Called the Two Oceans Aquarium because the vast Indian and Atlantic Oceans meet here, or almost here at the southern tip of the continent, the delightful underwater nature reserve is based at the V&A Waterfront in Cape Town, with over 3000 living sea animals, including sharks, fish, turtles, and penguins on display. 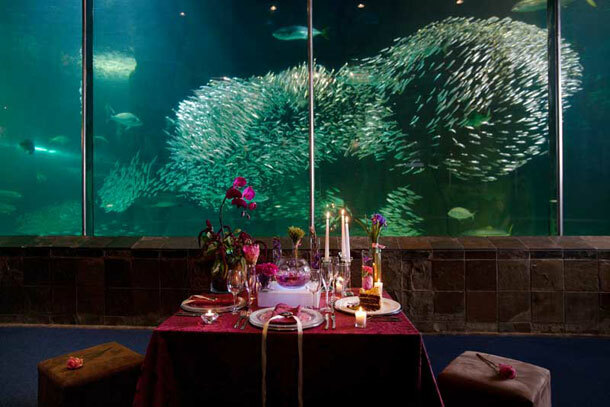 The Two Oceans Aquarium offers a spectacular venue for your very special day, your wedding. 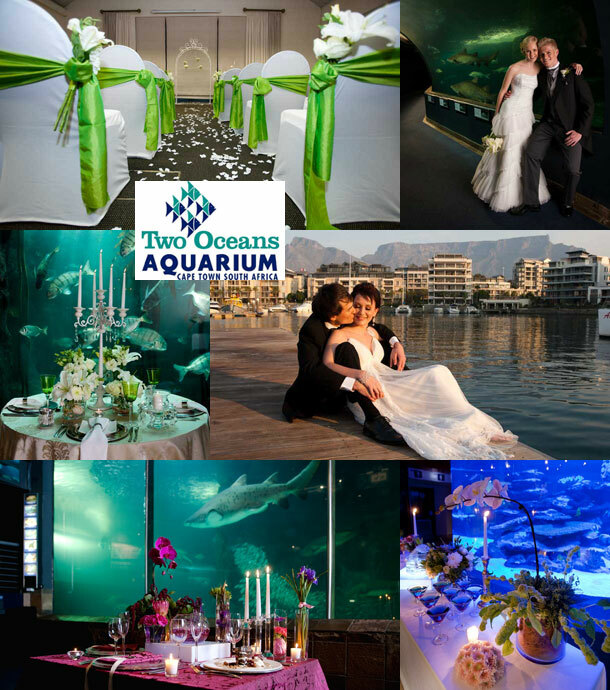 The Two Oceans Aquarium Wedding Package includes venues for your ceremony, welcome drinks and reception as well as the use of the whole Aquarium for your wedding photos. We recommend that you come in to view all of the venues and discuss the various options available. We are able to advise regarding menu choice and agenda for your function aswell as recommend florists, entertainment, photographers & décor specialists. Tranquility (Maximum 20 guest): With a window that looks into the Kelp Forest Display, it provides a truly magnificent backdrop against which to hold an intimate ceremony. The ‘Think Tank’ (Maximum 100 guests): Opening onto the V & A Waterfront Marina, the Think Tank has a magnificent view of Table Mountain. Atlantic Ocean Gallery (Maximum 50 guests): Come face to face with translucent, fragile jellies, alien-like giant spider crabs, and the master of camouflage the shy octopus in the Atlantic Ocean Gallery. The I&J Predator Exhibit (Maximum 100 guests or 90 guests if a dancefloor required: Enchant your guests in the company of ragged-tooth sharks, graceful rays and shoals of predatory fish. The I&J Predator Exhibit offers a breathtaking setting to make your reception memorable. To book your wedding and this unique and special venue telephone the team on +27 (0)21 418-3823. Alternatively for further details or to send an enquiry visit Two Oceans Aquarium.